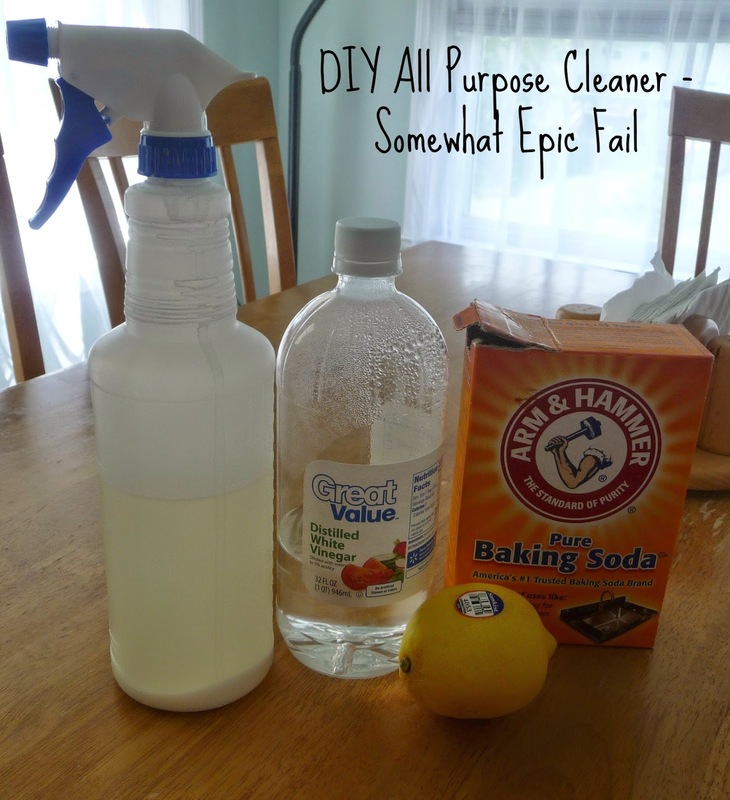 I've been wanting to make my own all purpose cleaner for a while now. I had all the ingredients, but hadn't gotten around to making it. Well, Sunday Michael gave me a reason to make it. We woke up to Michael naked and poop all over the his room and on everything. It was so nasty! This was not the first time that he's done this, but the first time to this extreme. It was so bad that Michael got a bath before heading down to the main floor while Jon cleaned his room. While Jon was giving Michael a bath, I grabbed everything that could go into the washing machine and started a load. If you don't follow my posts, we are in the process of potty training our almost 3 year old. Michael had been waking up in the morning, taking his diaper off, pulling a pair of underwear out of the hamper, and then putting them on. This time he decided that he would "paint" his bedroom and furniture with the poop that was in the diaper. I mixed all the liquid together in the spray bottle and then started pouring the baking soda in the spray bottle. Big mistake! Good thing I was doing this over the sink. Had a little explosion! The baking soda that was still in the bottle never dissolved. Jon took the spray bottle and sprayed it over the furniture and walls. He wiped it all down, but a few hours later everything had a while film over it. I went onto Facebook and asked all my friends that make their own cleaner about this. They told me that it was because of the baking soda and to rinse the areas with warm water. They also told me that I could leave out the baking soda. I wanted to make a new batch, but have not been able to. I've been doing some research and it looks like almost every recipe I've ran across uses baking soda. One thing that they all talk about is to mix all the items in a bowl and then pour into the spray bottle. I hope to be able to make up a new batch next week once I get a new spray bottle. FYI: the cheap $1 spray bottles at Walmart are not the best. So once I get a new bottle and make a new batch, I'll write about that and let you know if it works better. My first venture into home made cleaners was to get away from the aerosol anti-bacterial cleaner recommended for my marble bathroom vanity. I use 2 Tablespoons of liquid Castile soap and about 10 drops of tea tree oil in a liter bottle. Then fill the bottle with water. Shake a little, and distribute over the surface to be cleaned. I use this on the vanity, the kitchen sink, laminate counters, and non-fabric floors.